The Mother City has one of the best locations to see the sunset from the sea. Taking a sunset cruise from the Waterfront is definitely a must do on any itinerary, as it allows you to experience the city and its majestic nature offering in a unique way incomparable with anything else Cape Town has to offer. Take the cruise to experience Table Mountain and the city views from sea, while the sun dips into the sea’s horizon at sunset. There is a reason why our sunset cruise remains the most popular choice of cruising with our Tigger 2 Royale catamaran. This cruise takes you straight to Clifton 4th Beach, or if weather permits on the day, to Table Bay. Once we arrive at the destination, you get time to enjoy taking in the scenic view, while sipping on a complementary glass of Méthode Cap Classique sparkling wine. We then slowly cruise our way back, as the sun sets to the city lights lighting up the sky. The experience is rounded off with Table Mountain and the 12 Apostles looking down on us, providing an exquisite backdrop. It is the cruise for the romantic at heart. How Long is Our Cape Town Sunset Cruise? The duration of the sunset cruise is 90 minutes. Up to 65 people can take the cruise on a private basis, if you want to rent the entire catamaran, however, we also offer the cruise to the general public. Look forward to a luxurious cruise aboard our 55-foot power catamaran, powered by two 530hp inboard turbo charged diesel engines. While there are many unique ways in which to experience the Mother City – by helicopter, bicycle and car – a sunset cruise remains one of the best ways to catch a magical glimpse of South Africa’s most famous coastal city. Taking in the cityscape by boat provides you with an entirely different perspective of the city, than you’d otherwise be able to experience. 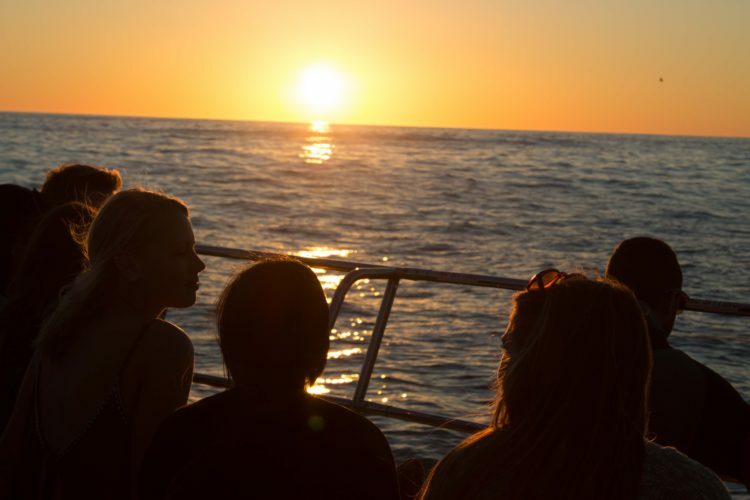 This is only part of the reason behind the continuous popularity of our sunset cruises in Cape Town. Our Tiger 2 Royale catamaran is capable of comfortably accommodating up to 65 guests, sailing at a top speed of 22 knots, with a comfortable cruising speed of between 12 and 16 knots. Throughout the years, we’ve hosted wedding parties, team building events, corporate functions and everything in between. In fact, we’ve catered for so many corporate clients over the years, many of which have become loyal and returning customers. Nothing excites us more than showing off our beautiful city from the unique perspective of the Tigger 2 Royale. Our team is always looking at new ways in which to further enrich this experience, and to provide our clients with even more memorable moments during their cruise. In order to avoid disappointment, we suggest that you book and confirm your cruise well in advance. To learn more about us, and for more information on our catamaran, speak to us today. We look forward to hearing from you.